California has made huge strides in combating climate change, but there is still a long way to go. Back in 2006, state lawmakers passed AB 32, also known as the Global Warming Solutions Act. It set a goal of getting greenhouse gas emissions down to 1990 levels or lower by 2020. The state managed to reach that goal four years early. 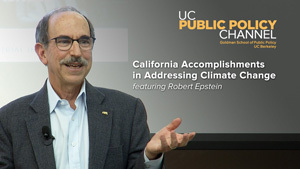 Robert Epstein, co-founder of Environmental Entrepreneurs, discussed the success of AB 32, and what needs to happen next, during a lecture at UC Berkeley’s Goldman School of Public Policy. Epstein begins with a look at what worked. Some solutions you might expect, like renewable energy, increased efficiency and long-lasting political support. Other factors may come as a surprise. The economic downturn helped, because people use fewer resources when they have less money. We also got some assistance from mother nature, with heavy rains in 2016 that boosted hydroelectric power generation. But, even though California has made great achievements in lowering greenhouse gas emissions, the state must make even deeper cuts to avoid the worst effects of climate change. A new version of AB 32 aims to get emissions 40% below 1990 levels by 2030. Epstein says California has much of the technology and policy in place to reach that 40% goal, but some aspects of the plan are unclear. He says we’re on pace to meet 50% renewable energy 10 years early, and have a solid track record when it comes to appliance and building standards. He thinks it’s likely we’ll figure out how to manage methane and increase energy storage. But, he sees big hurdles when it comes to reducing transportation emissions, cap and trade reductions, and management of both forests and land used for agriculture. Despite those challenges, Epstein is optimistic California can rise to the occasion and be an example to the world of how to combat climate change. He even has some ideas on how to overcome each major obstacle, and how the oil industry might be able to help. Health care is one of the hottest issues in California politics. Last year, state lawmakers shelved a controversial single-payer bill. So, what’s next? 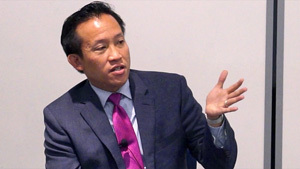 California State Assembly Member David Chiu sat down with Dr. Andrew Bindman at UCSF to discuss the complex realities of health care reform. Chiu represents the 17th Assembly District, which covers eastern San Francisco. He’s also one of eight members of the Select Committee on Health Care Delivery Systems and Universal Coverage, formed in the wake of the failed single-payer bill. Chiu and his colleagues on the committee have proposed 16 bills aimed at increasing health care access for Californians. But, he says there is still a long way to go to achieve universal coverage. Just over 93 percent of Californians currently have health insurance. Chiu says getting that number to 100 percent, would cost billions of dollars. Switching all Californians to a single-payer system, would cost an estimated $400 billion a year – $200 billion of that needed from new taxes. And, Chiu says the cost is just one major challenge. There are also legal hurdles, including the need for federal tax waivers, which he calls a non-starter under the current administration. But, that doesn’t mean single-payer is dead in California. Chiu talks about the impact the upcoming election could have, and who he thinks should really be leading the conversation. Are we beyond the brink? With months of oppressive heat and unrelenting fires – the fingerprint – or perhaps the firm boot print – of climate change is planted on California as global warming marches on to change everything about the future. “Adequate water for food for the nation is a water security issue, and it’s also a national security issue,” says UC Merced CITRIS researcher Roger Bales. Drought, climate change, an aging infrastructure and growing population threaten the water California’s San Joaquin Valley uses to supply most of the nation’s produce and a large proportion of its livestock and dairy. 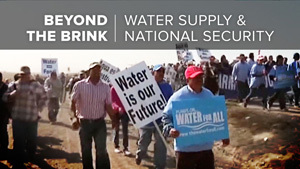 This excerpt from a new documentary previews an examination of water problems and solutions across the United States and globally. Are you ready for the next Big Earthquake? If you live in California, you’re no stranger to earthquakes, and you may worry when the next “Big One” will strike. Are you prepared? When is it likely to occur? How close will it hit? New programs from the University of California will help you find the answers. With a population of over 18 million people, an earthquake along the San Andreas fault outside of Los Angeles could be devastating. To imagine America without Los Angeles, watch Lucy Jones’ talk as she discusses how a severe earthquake there could affect the rest of the country. While many recent advances in building codes and construction techniques have reduced some of the danger, other features of this densely populated city such as transportation, power facilities, and communication systems have led to increased vulnerability in California and beyond. If they go down, what does that mean for the rest of the country? Watch to learn more. California isn’t the only state at risk, however. Most people think that in the United States, the area around the San Andreas Fault poses the highest risk for a large earthquake. But the risk for a “great earthquake” and tsunami is highest in the Pacific Northwest. 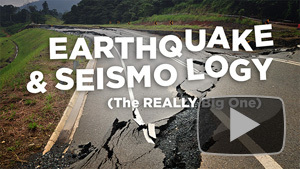 Join seismologist Diego Melgar in The Really Big One to learn about the risks, the geologic forces behind the potential for a truly massive U.S. earthquake, and efforts underway to build warning systems for the western U.S.
For more videos on preparing for the next Big One, visit Earthquakes and Seismology on UCTV. If you’ve spent anytime in California in the last few years, you know this: California is in the midst of a severe drought. But while the lack of rainfall is not in dispute, there is widespread disagreement on how to respond. A panel convened for Cal Day at UC Berkeley explores policy options that could attract support throughout the state, even from groups with conflicting interests. These experts argue that despite the diversity of perspectives in California, the state is well-positioned to achieve bipartisan consensus on solutions that will affect everyone. Just what do they have in mind? 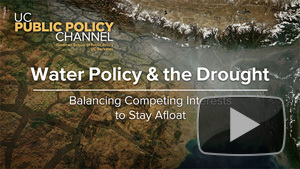 Watch Water Policy and the Drought to find out! Browse more programs from The Public Policy Channel.